The result: conceptual writers and their critics tend to focus on ideas, concepts, procedures (the methods of a text’s creation) over and above questions of aesthetics, form, and the particularities of the actual text on the page. But if we have learned anything about Conceptual art in the past 40 years or so, it is that we cannot completely ignore aesthetics in favor of concepts, that talking about LeWitt’s extraordinary wall drawings without mentioning the sheer, dizzying, scale of them, leaves so much to be desired. The interpretation of the work of art, of any work of art, whether written or visual, spatial or temporal, that ignores questions of aesthetics and form in favor of conceptual-only interpretations, seems inadequate at best. What do Conceptual art and conceptual writing have in common, then? Their producers deny aesthetics in favor of ideas in their manifesto-ish texts, but the works themselves demand that we apply multiple frameworks in their interpretation. They challenge us not to view or read only conceptually, but to read or view conceptually as well as aesthetically. The artists and writers behind the movements ask us to “think” about, rather than “read” their works, but the works themselves ask us to do both; to think about procedure, author, idea, yes, but to add that conceptual framework to our already-existing interpretive modes. We do not so much need to read conceptual work conceptually, but to read conceptually in addition to reading aesthetically, formally, historically, theoretically. Simply put, Conceptual art and conceptual writing demand more of their viewers and readers; both movements ask us to read more expansively, not less, and the question of how to interpret these works is part and parcel of the works themselves. Conceptual art and conceptual writing, then, make specific demands of their audiences. They challenge our existing interpretive frameworks, and ask us to incorporate more. They require readerships, viewerships, and thinkerships; they require us to be as tuned in to concepts as we are to aesthetics, and they ask us to interrogate our usual habits of seeing and reading. The conceptual work is as interested as much in its reception as it is in its creation. For me Conceptual art and conceptual writing are related in their aligned dedication to information and data. 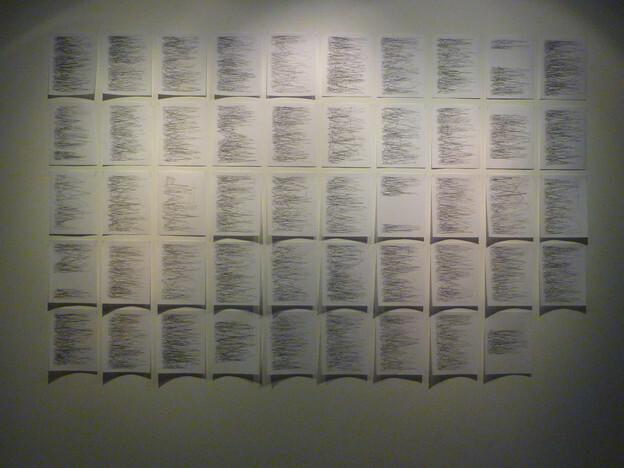 Conceptual writing is, at its core, an exploration of media and how media informs writing, or, as Douglas Huebler stated, a writing through “the facticity of [...] raw information without worrying about supposed meanings.” A number of conceptual artists explored textual data — Sol LeWitt’s painting instructions, Joseph Kosuth’s definitions, Dan Graham’s “Poem-Schema,” Carl Andre’s typewriter and graph paper poems — and these exemplars are all stylistic forerunners that inform my own practice. These sentences comment on conceptual writing, but are not conceptual writing. “Absolutely no relationship at all,” Joseph Kosuth suggests. Alternatively: a transhistorical encounter between information managers across the conference table of a data resources firm. Conceptual art, in Alexander Alberro’s influential account, appears on the scene as a “symbolic ally” of informatization and the “multinational corporate world of the 1960s.” It mimics and circulates through the logic of global capital. In Craig Dworkin’s formulation, it traffics in “information about information.” Conceptual writing, in turn, responds to the twenty-first-century intensification of these systems. Its trajectory is aligned with what Lawrence Lessig terms “remix culture,” and Lev Manovich calls the “database logic” of new media. As Dworkin aptly puts it, “the guiding concept behind conceptual poetry may be the idea of language as quantifiable data.” The broadband poet proceeds as a mechanism for filtering existing data flows — per Kenneth Goldsmith’s assertion in a text subtitled Managing Language In the Digital Age. In the spaces generated through accelerated data streams, the conceptual artist and the conceptual poet intersect as information managers. “Intelligent information management is all about providing the right access to the right information at the right time.” It calls for content marketers. See publicist-impresario Seth Siegelaub. In Lawrence Weiner’s recollection, “he was the advertising agency.” Whereas the dematerialized art object seemed poised to chart alternatives to market orientation, as Lucy Lippard proposed; its commodity status was almost immediately reinscribed through novel mechanisms of publicity and promotion. Amidst these efforts, conceptual artists’ theoretical texts intermittently veer into the vernacular field of the slogan: art as idea as idea/the idea is the machine that makes the art/the world is full of objects … I do not wish to add any more. Flirting with the intensified ethos of information management, much conceptual writing cannily traffics in the kinds of capital that accrue to strategically branded Warholian personae. Its more recent post-digital variants remediate the self-promotional content of social media networking platforms into books of poetry that enter into an infinite recursive loop wherein they, themselves, become the subjects of promotional status updates. Recently, Vanessa Place CEO founded the transnational information services corporation, VanessaPlace, Inc. Its mission is to “turn cultural capital into capitalized culture” through the mantra “we are what we sell, we sell what we are.” The website vanessaplace.biz hosts the video work Poetry Logos, a scrolling marquee of company slogans. Two of these are: in the future everyone will be language and the trick is non-communication. A third, following Lee Lozano, might be general strike. Kosuth’s assertion responds to an inquiry into the relationship between his own artistic and literary practice. Joseph Kosuth, Art After Philosophy and After: Collected Writings, 1966-1990 (Cambridge: MIT Press, 1991), 51. Alexander Alberro, Conceptual Art and the Politics of Publicity (Cambridge: MIT Press, 2003), 2. Dworkin’s introduction to Against Expression, “The Fate of Echo,” offers an important account of the relationship between conceptualist artistic practices of the 1960s and related contemporary literary experiments. He makes a distinction between the two categories on the basis of context, or Wittgensteinian meaning-in-use. Craig Dworkin, “The Fate of Echo,” in Against Expression: An Anthology of Conceptual Writing, eds. Craig Dworkin and Kenneth Goldsmith (Evanston: Northwestern University Press, 2011), xxvii. Lucy Lippard, Six Years: The Dematerialization of the Art Object from 1966 to 1972 (Berkeley: University of California Press, 1973), 263. In 1959, Brion Gysin said that writing was fifty years behind painting. And it still is. So if conceptual art happened fifty years ago, we’re just beginning to get around to it now. These are ideas that have never been explored in poetry. We’ve had a little bit of pastiche, a little bit of — you know, a line from here, a line from there. But we’ve never had the concept of lifting something that you didn’t write and moving it over five inches, saying that it’s yours, and claiming that it’s a newly authored text. In the 1960s, Sol LeWitt said something like “Conceptual art is only good if the idea is good.” I think that conceptual writing would agree, at least the best of it would. Like anything else, conceptual writing is looking for that “Aha!” moment, when something so simple, right under our noses, is revealed as being awe-inspiring, profound, and transcendent. I think that writers often try too hard in the name of expression, when often it’s just a matter of reframing what’s around you or republishing a preexisting text into a new environment that makes for a successful work. Of course this is nothing new: think of John Cage’s notion of silence or Duchamp’s urinal. But when it comes to writing, these approaches have rarely been investigated. I’m always shocked at how narrow the discourse around contemporary writing is as compared to contemporary art. Contemporary art has long staked a space in hybrid practices, ones that are both conceptual and identity-based, ones that at once reify and question notions of identity, destabilizing and deconstructing them in compellingly complicated ways. Think of the practices of Adrian Piper, David Hammons, Jimmy Durham, Kara Walker, Gran Fury, Felix Gonzalez-Torres, Rirkrit Tiravanija, Martha Rosler, Tania Bruguera, Jayson Musson, Sharon Hayes … the list could go on and on. I can’t imagine that any one of these artists would self-identify as “avant-garde” nor do the critical discourses around their work invoke that term. Why does the discourse around contemporary writing still feel the need to cling to binaries like “mainstream” and “avant-garde?” Somehow by upholding such binaries in a critique of binaries only serves to reinforce those same binaries. Conceptualism was not prescriptive. While the discourse surrounding such a predominant mode of writing appeared hegemonic and canon-building, the writers involved in the movement had no such agenda; ours was a response to technology and offered one way of framing language and its new modes of slippage in a new landscape. As Sol LeWitt so elegantly wrote in 1967, “I do not advocate a conceptual form of art for all artists. I have found that it has worked well for me while other ways have not. It is one way of making art; other ways suit other artists.” The form remains open to reimagination, reinvestigation, and reframing (I'll Drown My Book: Conceptual Writing by Women, for example). In the end, conceptualism was another tool in the writers’ toolbox, no more, no less. 25. 1. Conceptual writing is allegorical writing. 29. what is the matter with you? "Some Thoughts on Conceptual Writing"
In contemporary art circles, conceptualism is often thought in opposition to aestheticism, a term applied to art that supposedly aims to evoke sensual pleasure or beauty. Kant advanced a different formulation of the “aesthetic” as an affect aroused when a mind encounters something it cannot comprehend and define with a concept. At least two things can happens here. One, the mind withdraws from externalities, turning inward to reflect upon (a lack within) itself – often called “critique.” Or two, remaining externally focused, mind creates a wholly new concept to name the provoking experience. Kant had in mind the new concept “mass,” necessary to explain the relationship between matter and acceleration in gravity. For Kant, aesthesis was mostly aroused by natural phenomena – crashing icebergs and infinite alpine vistas. One thing that could not do it for him was art, because, being man-u-factured, art is by definition comprehensible. In the 1940’s Clement Greenberg believed a truly aesthetic and incomprehensible manmade phenomenon had finally arrived in the form of Abstract Expressionism. Can we think conceptual art in relation to this idea of the aesthetic? According to Peter Osborne, we can. In Osborne’s view, what distinguishes the two is that, where traditional art achieves aesthesis by presenting a relatively simple experience of incomprehensibility, e.g. an Abstract Expressionist painting, in a conceptual work the ungraspable element is more complex. For example, let us consider One Billion Dots (1971), reproduced in color in 2008 as One Billion Colored Dots, a work by Robert Barry composed of precisely 1,000,000,000 printed dots, 40,000,000 in each of 25 volumes. Osborne’s point is that whilst in this work we have both a graspable phenomena – the 1,000,000,000 dots, which you could count if you had time – and a well-defined concept – One Billion Dots – still something fails to cohere, and inventing a new concept to name it will not resolve the problem, for the ambiguity lies between the material and the concept/idea. Of course many works from all ages have this quality. Most images of the Divine aim at it, as do many images of the Woman. Can we relate this perspective to contemporary conceptual writing? Clearly Osborne only deals with pieces performing aesthetic work – provoking the mind to a sense of its own limits (whether experienced as sublime or traumatic). Not all conceptual art does this. Neither should all conceptual writing. But that which does can be neither pure information nor pure idea, for in this definition the aesthetic dimension lies between the matter and the signifiers, making the material dimension as important as the conceptual/informational. One such work is NourbeSe Philip’s Zong! (2008), which rigorously insists on both the materiality of the page and the characters sinking into its depths, and the conceptual meanings of its words – “black folk being drowned.” Between these two something does fail to cohere – the intentions of those doing the drowning. At this point we return to the critical or self-reflexive aspect of aesthetic experience, namely that something is wanting in the mind. In this case, the lack is not conceptual. It is ethical. It has become unfashionable to speak of the sublime/trauma. Zong! presents a clear argument for its return.